Simplicity has a name, and it’s Anya Hindmarch. The woman behind the classically chic collection of bags and the infamous ‘Be A Bag’ picture totes, has reached a new level of design genius. The ‘Sydney Plaited Leather’ Woven barrel incorporates the exceptional level of craftsmanship emblematic of Hindmarch’s accessories, while staying true to her classic style. The leather is woven and intertwined together in a trendy fashion, while the signature bow logo is subtly emblazoned across the front. 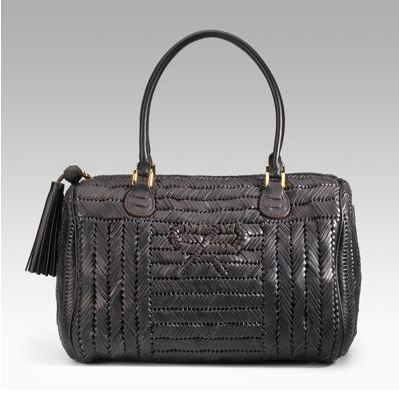 The barrel shape lends an air of refined sophistication, while the side tassel shows off the bag’s playful side. This piece is a timeless beauty, gracing your arm for years to come.